New Insights into Natural and Artificial Egg Incubation. 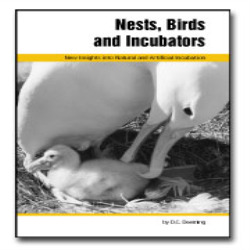 The only book for aviculturists and bird breeders which compares the current scientific knowledge of natural egg incubation among wild bird species with techniques of artificial incubation. Dr Charles Deeming is one of very few scientists across the world with the balance of practical experience to be capable of writing such a book. Essential reading for everyone interested in understanding what really goes on in the egg incubation process. The very latest, radical incubation procedures are also discussed.